MOSCOW: Russian President Vladimir Putin on Friday appeared to cosy up to US President-elect Donald Trump while stamping his authority as the key powerbroker in Syria, reports AFP. At his annual end-of-year press conference, the confident Kremlin strongman praised Trump for tapping into the public mood in the US to claim his surprise win in the elections. “He went to the end, though nobody believed that he would win except us,” Putin said. Ties between Moscow and Washington have hit their lowest point since the Cold War under President Barack Obama due to the Ukraine crisis and Russia’s military intervention in Syria. But the election of Trump, who praised Putin as a strong leader, has provided a surprise fillip for the Kremlin, with the Russian economy still struggling due to Western sanctions and lower oil prices. 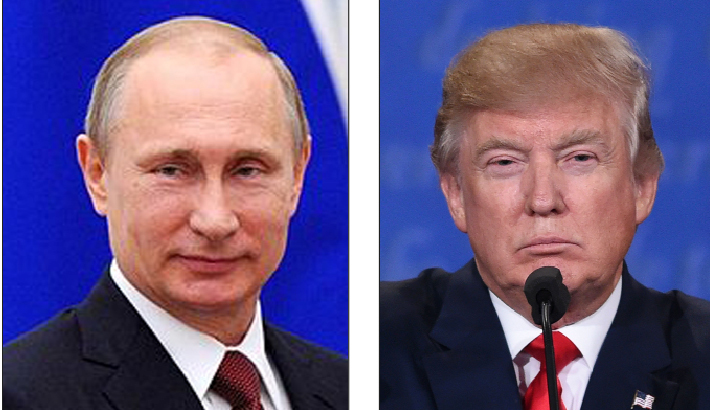 Officials in the US have accused Russia of cyber attacks aimed at interfering with the US vote, with some alleging Moscow sought to tip the balance in favour of Trump. The Russian leader also sought to play down a potential nuclear stand-off with the future US president, a day after they both pledged to bolster their nuclear capabilities. Putin insisted there was “nothing unusual” about Trump’s call in a tweet Thursday to bolster America’s nuclear capability, hours after he ordered his top brass to strengthen Moscow’s “nuclear potential”. “We will never look to be dragged into an armed race and to spend resources that we can’t afford,” Putin said, after insisting he understood the US was the stronger military power but “we just say that we are stronger than any aggressor”. While Putin was offering warm words for the incoming US leader, he was also flexing Russia’s muscles as the key powerbroker on the conflict in Syria. The Syrian army said late Thursday that it had retaken full control of Aleppo, scoring its biggest victory against opposition forces since the civil war erupted in 2011. “The liberation of Aleppo from radical elements is a very important part of the normalisation in Syria, and I hope, for the region overall,” Putin told defence minister Sergei Shoigu in a meeting aired just as the press conference was starting.